Dyson Robinson, left, and E.J. King head to Kobe for this weekend's Western Japan Athletic Association boys tournament; Rodrick King and Nile C. Kinnick travel to American School In Japan for a rematch of last January's Far East Division I and combined tournament finals. Kadena’s and Kubasaki’s boys and girls teams have only faced each other, not counting Japanese opponents, since the Okinawa basketball season began in December. They’ll get a chance to see somebody different Saturday and Sunday when Taipei American School in Taiwan sends its Tigers boys and girls teams to Okinawa for the Taipei Basketball Exchange, now in its fourth year and this season being played at Camp Foster. “We’re extremely grateful” for an opportunity to see another opponent, Panthers girls coach Johnny Cooper said of taking on the Tigers. Eight total games are scheduled, four on each day starting at 10 a.m. Saturday and 9 a.m. Sunday. The Panthers girls have beaten the Dragons thrice with relative ease. 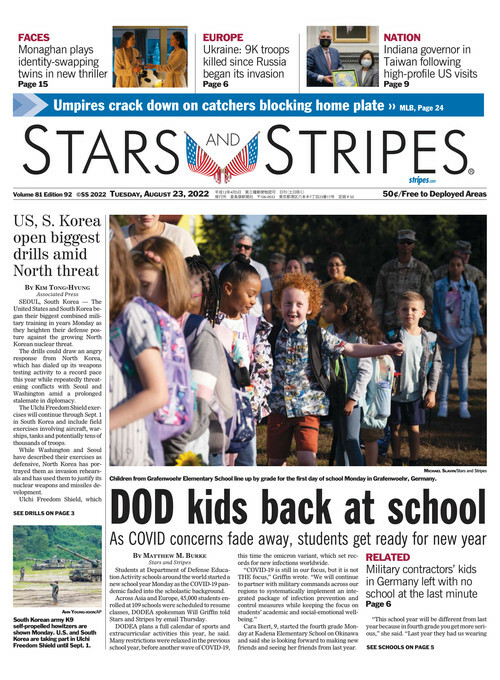 Thus, in Taipei, Kadena gets “a chance to see … what we might face,” Cooper said, in regional events such as next week’s American School In Japan Kanto Classic or next month’s Far East at Camp Humphreys. Taipei American at one time was a DODEA school, until 1979, when the United States-China joint communiqué switched diplomatic recognition from Taipei to Beijing and U.S. bases in Taiwan were shuttered. The Tigers continued to attend Far East basketball and volleyball until 1983, when Taipei American joined the Interscholastic Association of Southeast Asian Schools. Another pair of schools that have seen an awful lot of each other are E.J. King and Matthew C. Perry in Japan, which have played the last two weekends at Marine Corps Air Station Iwakuni and are due to face each other again four more times this season. The Samurai and Cobras this weekend venture to Japan’s Kansai region to play in the Western Japan Athletic Association tournaments, boys at Canadian Academy in Kobe and girls at Senri Osaka in northern suburban Osaka. “I really enjoy the international competitions,” Cobras boys coach Travis Elliott said. He’s a veteran of games against WJAA teams, having played for the Samurai in 2001 and 2002 and now in his first year coaching at E.J. King. “I like the exposure, of playing somebody besides our American schools. You see different faces,” Elliott said. This is the last weekend before semester exams, but there’s still much on the ledger in terms of athletics competitions prior to what’s euphemistically termed “dead week,” to give students a chance to focus on tests. Among the bigger matchups, Daegu’s girls basketball team puts its unbeaten record on the line at Humphreys on Saturday; the Warriors came from behind to beat the Blackhawks at home on Jan. 5. In a rematch of last January’s Far East Division I and combined tournaments finals, Nile C. Kinnick boys, with one defeat, travels to ASIJ, which won 10 out of 11 games before the holiday break. The Red Devils won the D-I final; the Mustangs avenged that defeat two days later in the combined Far East final.